It wasn’t until I was 22 years old, after graduating from college that I first left my hometown in Tainan, Taiwan. I went to a nearby city, Taichung where I had my very first opportunity to step into a gender-friendly space. To be honest, I was hesitant for the first few times, deciding whether or not I should take the elevator to the eighth floor and visit The Taiwan GDi Association LGBT community center. After a few tries I finally built up the courage to go upstairs. I was peeking through the glass door, seeing people laughing and singing together – I was extremely envious. I knew if I pushed the door, I would automatically unmask myself and they would know that I was gay. In the end, I didn’t go inside that day. I instead found a more convincing excuse, to participate in their volunteer recruitment program. It gave me the chance to walk through the door and see what it is like inside, but I was still very anxious, even then. 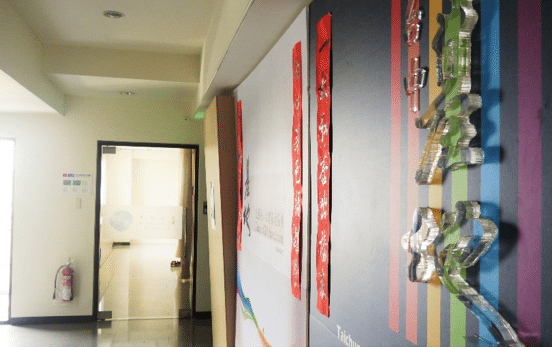 For fulfilling the needs of guidance and support for sexual minority, organizations like this are now becoming much more common in Taiwan, but this phenomenon itself is also a sign offering us a reflection of whether or not our society is actually turning more friendly. My admirable friend, Shader Liu, is one of the founders of Taichung GDi (GDi is the spelling of “基地” [ji di], which in Mandarin, means “base”, or “safe place” like home). The first time we met was at a gay counseling workshop in 2014, where he acted as a guest speaker delivering a presentation related to social work with sexual minorities. There is one thing that he said that day that is still stays in my mind. Indeed, our space has been restricted because of potential outside threats, bringing us fear to do what straight couples do in public space without a second thought. We may simply want to hold hands or kiss the one we love, but somehow it is just too difficult to ignore societies’ eyes. Hsien-Yung Pai’s masterpiece, Crystal Boys, describes without any exaggeration the oppression towards the gay community of the 1970s in Taipei City, Taiwan. During this period, 228 Memorial Park, located in downtown Taipei, was well known not only in memory for the victims of the 228 Incident*1 (description in footnotes) , but because it was also a place where gay men would regularly gather. After more than forty years, Taipei has gained a reputation as the “Beacon for LGBT community in Asia” as stated by the likes of The New York Times, and a place where the true color we bear can shine even more often than any other moment in history. Yes, Taiwan is making progress, but we still have to think about one thing in particular. I think most of you must be familiar with these two words, which means to reach real equity for minorities. The word “Space” in particular, as an essential element for every living creature to practice their daily lives’ purpose, should be can be shared based on not only equality but equity. You may ask what the difference is between these two terms. Here, equality means to give everyone the same amount, regardless of who you are or what your identity is, but on the other hand, for those who already have more, they remain at an advantage, which is still unfair to those in the minority. Unlike the above, equity refers to allocating to both the majority and the minority differently, depending on individual situation, in order to end up endowing the same amount of power and resources, the nature of real justice in brief. So what we wind up with is a tiny area of gay-friendly space compared to this big world for the rest. Are these LGBTQ spaces a temporarily safe haven for us wandering in this society filled with heterosexual hegemony? Or are they an extra bonus that we get, in addition to a broader inclusive and harmonious public space? What do you think? Of course, I expect one day the latter will be realized, and for this goal, I have tried to spread the six-colored rainbow and let it be seen wherever I go: a scarf, a wristband or stickers on my bag. We don’t wait for a space – we create it. These may just be small steps, but with more people becoming involved, we can make changes to the attitudes of our society. Our true colors need to be seen every day, everywhere, as if we are actually living in a space we can hope for. A world where we can smile all the time – not just once a year at a parade. The very famous Taiwanese female singer, A-mei, is well-known for her active action in promoting LGBT people’s rights. For her 10 consecutive concerts in The Taipei Arena back in March and April if 2015, she performed the popular song, “rainbow”, accompanied by a big rainbow flag spread across the audience. So, every gay-friendly superhero, if you have the courage and determination, please come out of the closet to show the world your positive attitude, and to help change society with your individual passion. Are you ready to practice a bit of justice for our generation? What is your positive change will you make today? *1：228 Incident, or The February 28th Incident, was an anti-government uprising in Taiwan. Taking its name from the date, it began on February 27th, 1947, and was violently suppressed by the Republic of China government led by KMT (Kuomintang, also translated as the Chinese Nationalist Party), which killed thousands of civilians on February 28th. The massacre marked the beginning of the Kuomintang's authoritarian regimes (also called White Terror period, compared as if there were always ghosts keeping an eye on peoples’ actions) in Taiwan, in which thousands of inhabitants vanished, were killed, or imprisoned. This incident is one of the most important events in Taiwan's modern history, and is a critical impetus for the Taiwan independence movement.